Discussion in 'Modified 2011- 2019 Explorers - Tuning & Mods' started by Drive XR7, August 31, 2016. 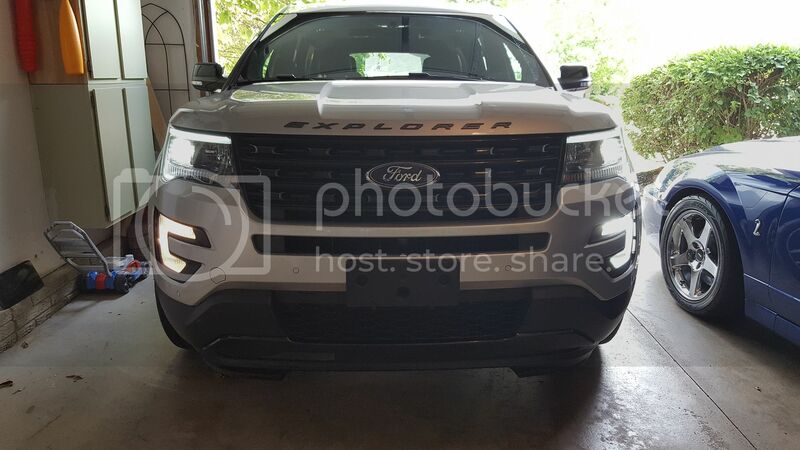 When I purchased my '16 Explorer, I didn't get the LED foglamp option. When I clicked on the foglamps the temperature of the halogen foglamps and LED headlights is very different so I'd like to upgrade the fogs to LEDs similar to what is offered from the factory. Has anyone upgraded their fogs to LEDs to match the headlights? I'm running diode dynamics xp80 fogs. I wasn't impressed with the jdm replacements. Had them on my f1 and there are definitely better led upgrades out there for a reasonable price. Installed the JDMs today. They looked nicer than stock but aren't any brighter. Significantly nicer than the yellow bulbs. LEDS on right, stock on left. Ok, perhaps this doesn't apply because I have a 2017 that has the LED fogs already installed. However, when I briefly looked at mine to try to offer some help I noticed there is an access hatch directly behind the fog lamps in the inner fender well that appears to be to for access to change the bulbs. It's certainly not big enough to change the entire light assembly (I imagine you'd have to take out the inner fender well to do that), but I can't imagine they'd put that access hatch there if you couldn't change the bulb. You might want to take a look and see if you have the same access hatch in your fender well. If so I would imagine you could just do a quick bulb swap. I just want to know if I can get hid foglight bulbs for my 2016 without replacing the glass and everything. Which sounds crazy to me. You probably could but then they would be more like driving lights than fog lights. Also, halogen and HID's use different housings to project the light. There should be a couple of threads on HID fogs in the 'Modified' sub forum but I don't recall if they were for the 2016 type fixtures. You an use the 'Search' feature to find them. Those are LED not HID. In looking at the picture above, it looks like a much better match. The halogen high beams I think will not appear to be as bright as the LED fogs or low beams. Memers have changed the highs to LED but reports say that while they are brighter, they don't shine down the road as far. Yes you can. You can run hid or led if you like. I'm running led drop ins for the fogs and highs. The '16+ foglamps are a different design from the previous years, so my experience is only with the '16+. There is a little door/hatch on the front of the splash shield in the wheel well. It opens, you reach your hand in, and remove the old halogen bulb. Pop in the new LED bulb, and reinstall the door/hatch. 5 minute job. I did not have to replace the whole thing. And as I shared earlier in the thread here's what the hatch looks like so you know what you're looking for. I would like to know what is the number of the fog lights of the same color as the headlights thank you. Your thread/post was moved to this existing one on the same issue. Found these LED lights at AutoZone for $140. Looked awful with yellow halogens, plus no fog in my area. The color is an exact match, and not too bright either.